If you're eligible to vote in next week's mid-term election in the United States, please do so. Don't let it slide. Don't believe the polls that say your side (which ever side that may be) is "ahead" and may not need your vote. They all spin the story, they all rely on insufficient data, they all have an agenda. Have your own agenda and vote. If I can, you can. 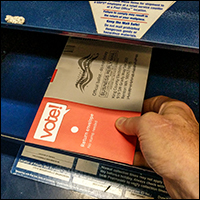 And yes, that is my hand mailing in my ballot late last week. Your vote absolutely can make a difference. Even if it's just widening a margin of victory, that, too, sends an important message. But many races are probably closer than most realize. It's time for me to speak out. Microsoft, I lova ya, and you've been very good to me, but, dammit, you gotta do better! Seriously, it's time to reevaluate what you're trying to do and how you do it. I have specific suggestions. Finally, let me offer up some ideas on where those Facebook friend suggestions come from. As weird as they probably seem, if you look deeper they kinda make sense (even if they are still annoying). I don't know about you, but I feel better. In recent weeks, I've seen calls from several sources suggesting that Microsoft stop, take a breath, and seriously review their update process. Can you advise me on the “rules” of the internet regarding free speech? I've had comments on some sites and posts on a discussion group deleted by the owner. Doesn't that violate my right to free speech? No, it doesn't. Not even close. Free speech is an interesting concept in general, especially in these turbulent times. Take it to the internet and things get even more “interesting”. Yes, there are rules, and even laws, but it's an incredibly complex issue. Let's start by acknowledging that there is no such entity as “The Internet”. I have occasionally received ‘invitations' from people, most of whom I know only vaguely, to join them on Facebook. I've no wish to join Facebook, so just ignore these. Yesterday, however, I received yet another invitation, from someone who runs art classes I once enquired about. Underneath, Facebook lists three other people who have invited me in the past. And, below that, there is a list of nine other people ‘whom you may know' – none of whom have ever invited me, and three of whom I have had only very basic contact with – eg a single enquiry made to an archivist. This really worries me – how does Facebook know that I have ever had any contact with these people? Can Facebook access their emails, see where they are all going to, and cross-reference them with people who have received an invitation from elsewhere? Or can they, having once been given my email address, somehow gain access to my Sent messages, see where they are being sent to, and cross-reference them against their existing Facebook membership?? This really worries me – it just seems such an invasion of my privacy, and concerns me that they may be able to access all sorts of personal information and conversations. I'm not privy to all the details of how Facebook works. That being said, I can hazard a guess as to how Facebook (or any social network with similar capabilities) might be making these recommendations. No, Facebook is not looking at anyone's email (outside of messages sent on Facebook itself). Facebook friend suggestions and invitations to join Facebook — whether emailed, or suggestions when signed in to Facebook — are nothing more than what I'd characterize as very educated guesses. Continue Reading: Where Do Facebook Friend Suggestions Come From? « Previous post: Ask Leo! #727 – What’s the Difference Between the Web and the Internet?